A NASA visualization of Earth's magnetic fields. Earth's north magnetic pole is so out of whack that scientists need to update the global magnetic-field model they released only four years ago. Could that be a sign that the magnetic pole will flip soon? The World Magnetic Model (WMM) — the name of the updated representation of the magnetic field of Earth — is expected to be released no earlier than Jan. 30. That's about two weeks later than planned, with the delay due to the government shutdown, according to a report in Nature. It's no news that the pole is moving; long-term records from London and Paris (kept since 1580) show that the north magnetic pole moves erratically around the rotational north pole over periods of a few hundred years or longer, Ciaran Beggan, a geophysicist with the British Geological Survey who is involved in WMM updates, told Space.com in an email. He cited a 1981 study from the journal Philosophical Transactions of the Royal Society of London. But what's really catching attention is the acceleration in movement. Around the mid-1990s, the pole suddenly sped up its movements from just over 9 miles (15 kilometers) a year to 34 miles (55 kilometers) annually. As of last year, the pole careened over the international date line toward the Eastern Hemisphere. The chief cause of the movement comes from the Earth's liquid-iron outer core, which is also called the "core field." Smaller factors also affect the movement. Those influences include magnetic minerals in the crust and upper mantle (especially for local magnetic fields) and electric currents created by seawater moving through an "ambient magnetic field," according to the 2015 report of the WMM. "One of the reasons we can update the map is that the European Space Agency launched a set of highly accurate magnetic-field satellites in 2013," said Beggan, referring to Swarm. "We have a superb data set from which we can make very good magnetic-field maps and update them every six to 12 months," Beggan added. "We noticed that the specification of the WMM was not being met in the high-latitude region around the pole, as the error exceeded 1 degree of grid angle on average. This triggered us to examine whether it was worth issuing a new update." What's more, the core field appears to be weakening — which may be a sign that the planet's magnetic field will flip. To better understand how that would happen, here's how the core field works, according to Ronald Merrill, an emeritus professor of Earth and space sciences at the University of Washington, who spoke to Space.com's sister site Live Science. One easy way to imagine the field is to think of a bar magnet that runs through Earth's center and has a north pole and a south pole, said Merrill, who was not involved in the new WMM research. That magnet is strong, representing roughly 75 percent of the intensity of Earth's magnetic field at the surface. Of course, a bar magnet is not a perfect representation — it's actually electric currents that generate the Earth's magnetic field — but the model makes it easier to imagine what's happening to Earth, Merrill added. Specifically, the "bar magnet" is not only moving, but also getting weaker, by roughly 7 percent every 100 years. As for the other 25 percent of the magnetic field, Merrill said that's generated from another field, which you can picture as another moving bar magnet. 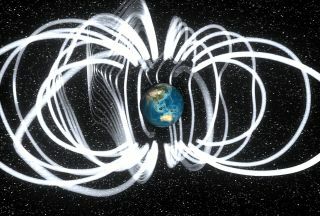 Here's an interesting bit: As the central bar magnet loses intensity, this second, weaker magnetic field generates more influence on Earth's global magnetism. "And that's what's causing this field to move in the direction [of Siberia]," Merrill told Live Science. Earth's north and south poles periodically swap locations, with the last flip happening about 780,000 years ago. (The poles also weakened temporarily and rapidly about 41,000 years ago, Beggan added, but never underwent a full flip.)) A 2018 study in the journal Proceedings of the National Academy of Sciences suggested that Earth's magnetic field got weaker before the big changeover. While any magnetic-field flip would still be thousands of years away, the effects could be profound on technology, if similar to today’s technology. This is because the weaker magnetic field would be somewhat poorer at shielding Earth against the solar wind (the constant stream of charged particles emanating from the sun) and cosmic rays (blasts of radiation from deep space). Magnetic compasses would not be as accurate, and satellites that monitor the weather or carry telecommunications signals could be disrupted, said Monika Korte, head of GFZ Potsdam's working group on geomagnetic field evolution in Germany. "Regarding increased radiation, that would go along with decreased shielding, [but] it seems that the atmosphere would still provide sufficient shielding at Earth's surface that humans and animals would not be significantly affected," she told Space.com in an email. "However, all the effects we currently only see during strong solar/geomagnetic storms would likely increase and occur ... during moderate solar activity," she added. "This includes satellite outages or damage to satellites, increased radiation doses on long-distance aircraft and the ISS [International Space Station], [and] distortions of telecommunication and GPS signals." Ongoing monitoring of the Earth's geomagnetic field (which includes the pole) will continue after the WMM release, principally through the European Space Agency Swarm mission, Korte said. But she noted that measuring the north magnetic pole's position is a challenge. That's because the pole is located in a remote area and the measurement of Earth's magnetic field is influenced by all magnetic-field sources — including the magnetic fields found in Earth's atmosphere (the ionosphere and magnetosphere). "It will depend on the future magnetic field change, which we cannot predict, if another update to the model out of the usual schedule might be required," she added. The next update to the WMM after this year's is expected early in 2020, Beggan said. You can read more about the WMM here.